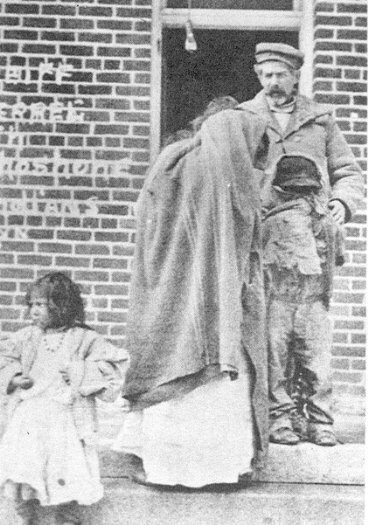 Mike Daggett lived on a reservation near Fort Hall, Idaho, where, in 1890, he lost his land to settlers. Enraged, he took his family into Nevada and began living a nomadic life. Moving from place to place, working some, they mostly lived off the land. Ranchers in the Little Salmon River area in northern Elko County remember that Mike and his sons were good workers in the hay fields. The family stayed to itself, aloof from both whites and Indians, moving often. The hard winter of 1911 found Shoshone Mike and his family settled down in Little High Rock Canyon in northern Washoe County, Nevada, until warmer weather came. With him was his wife; two sons, Charlie and Gnat; two daughters, Snake and Toad; two adolescent males and four children. To sustain themselves, they killed a few cattle for food and hung part of the meat in trees to freeze. Left - Shoshone Mike's war bonnet, found at Kelley Creek by a member of the Posse. Four sheep men rode into the canyon and Mike thought maybe they were coming to get his family for rustling cows. Mike, Gnat, and Charlie ambushed them, mutilated the bodies, and stole their clothing. Now, in more serious trouble, the family fled east. On February 11, Reno's Nevada State Journal headlined the murders. People on remote ranches panicked, many women and children went to the nearest town for safety. The men who stayed kept their guns nearby and continually looked over their shoulders in fear. Nevada State Police put together a posse and, with the help a Paiute tracker, Skinny Pascal, began a two-week pursuit. Pascal, reading sign, led the officers over the Black Rock Mountains, across Black Rock Desert, then to the Quinn River area. By now posse members were chilled to the bone and trail weary but they kept up the chase. Pascal followed footprints around the south end of the Santa Rosa Mountains, then on an easterly course toward the Little Humboldt River. They found Mike and his family at Kelley Creek, north of Golconda on February 26, 1911. The band of Indians knew they were following them and it was just a matter of time until the posse found them. They began singing and chanting. Shoshone Mike's clan was ready to die. Gunshots interrupted the ceremony. It was two black powder firearms against at least eighteen guns. It didn't take long to pick off the warriors. The women took up bows and arrows and spears forcing the posse members to shoot in self defense. When the smoke cleared, eight of the 12 family members were dead. Only Snake, a ten-year-old boy, a toddler and a baby survived. The band's dead were buried in a common grave blasted from the frozen ground with dynamite. One posse member had died. The so-called last Indian uprising was over. Indian uprising? That's what the press and a lot of people called it but it was more like a family that panicked and fled from the law knowing that they would have to pay a deadly price if caught. Yes, they committed a terrible crime and cannot be excused. In the end, though, it wasn't an uprising. Just an Indian family who got into a heap of trouble. Author's notes: This was difficult to write a short story of this event. Not one account agreed on all the facts. Mike was listed as Shoshone, Bannock, and Goshute; as coming from Idaho, southern Utah and southern Nevada, and starting the rampage from Little High Rock Canyon and clear across the state in northeastern Elko County. His name, mostly listed as Shoshone Mike also appeared as Mike Daggett, Salmon River Mike, Indian Mike, and Rock Creek Mike. There are so many differences in details that sorting them out was impossible. This is not an attack on the authors - they scoured records and newspapers, talked with people, and wrote their interpretations. Sources: Aged in Sage, Jean McElrath, 1964; Nevada's Northeast Frontier, Edna Patterson, Louise Ulph (now Beebe), and Victor Goodwin, 1969; The Indian Massacre of 1911, Effie Mona Mack, 1968; The Last Free Man, Doyle Hyde, 1973; "Stories of the Old West," Shoshone Mike vs. the Nevada State Police: The Battle at Kelley Creek - 1911, Frank Adams, 1998 (from www.nevada-history.org); Humboldt Star (Winnemucca, Nevada), February 28, 1911; and "Inventory and Assessment of Native American Remains from the Western Great Basin, Nevada Sector, in the National Museum of Natural History," (www.nmnh.si.edu). Photographs from the collections of the Northeastern Nevada Museum, Elko.